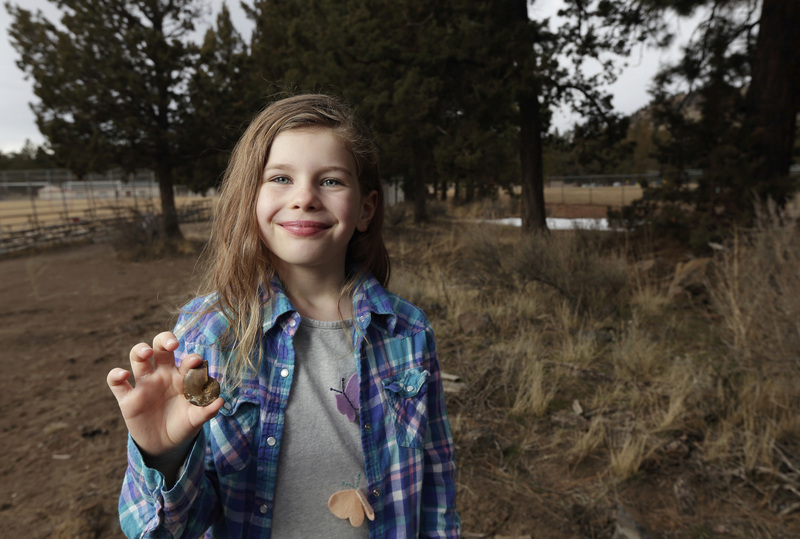 Seven-year-old Naomi Vaughan was poking around the sagebrush next to the soccer fields on 15th Street in Bend, Oregon, when she came across a shining rock with a spiral formation. 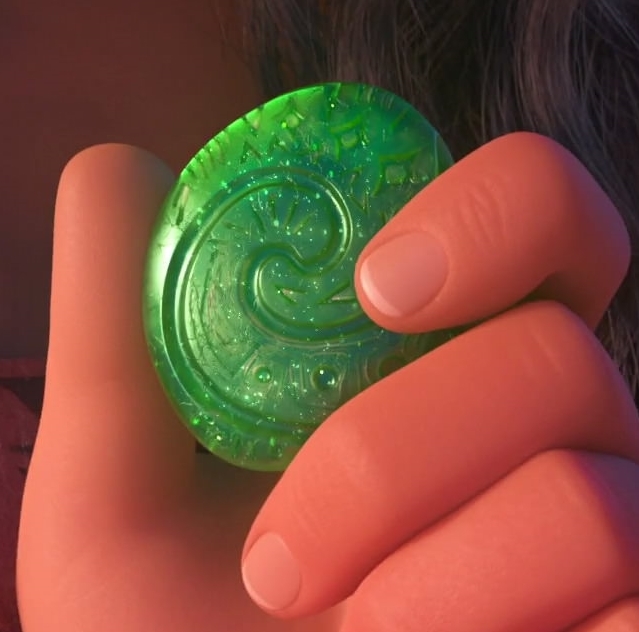 She dubbed it her Moana rock, because of its striking resemblance to the Heart of Te Fiti, a mystical greenstone that is the reason Moana undertakes her epic hero’s journey in the animated Disney movie. As appropriate as Naomi’s nomenclature is, in fact the “rock” is an ammonite fossil, but like the Heart of Te Fiti, it too is mysteriously far from home. When she showed it to her mother, Melissa Vaughan recognized from its shape and pearlescence that it was likely a fossil. Paleontologists confirmed that it is indeed an ammonite and is at least 65 million years old, possibly as much 100 million years old. What it was doing next to a Bend soccer field is not so easy to determine. Paleontologists say ammonites are not naturally found in Bend, but are common to the east near Mitchell, more than 80 miles away. How this ammonite wound up in Bend is a mystery. Greg Retallack, director of paleontological collections at the University of Oregon Museum of Natural and Cultural History, believes the fossil originated from the Bernard Formation of Bernard Ranch near the abandoned Eastern Oregon town of Suplee — about 112 miles east of Bend. “Presumably there was some family connection between the ranches and Bend, or it was part of a school fossil collection,” Retallack said. Or it came from somewhere else entirely. Its dark hue, pearlescent shine and excellent state of preservation are not typical of ammonites native to the state of Oregon. It could easily have been transported into the state by a collector and been mislaid. There’s no way of knowing as it was not recovered in a proper scientific excavation, and even if it had been, the find site might not be probative if it was simply a lost treasure dropped in the sagebrush in recent history. On the other hand, it’s still possible that it’s some kind of Oregonian fluke, an exceptional specimen that was fortunate enough to be preserved in a particularly nurturing environment and then made its way to the soccer field by natural means rather than having been transported into Oregon from foreign parts. Because of all these unanswerable hypotheticals, the fossil is worth very little from a paleontological perspective, and even less on the market. Twenty bucks at most, experts think, even though it is such a handsome example. Ammonites in excellent condition like this one, more often found in Canada than the US, can run in the thousands of dollars. That suits Naomi just fine ’cause she ain’t selling her Moana rock. 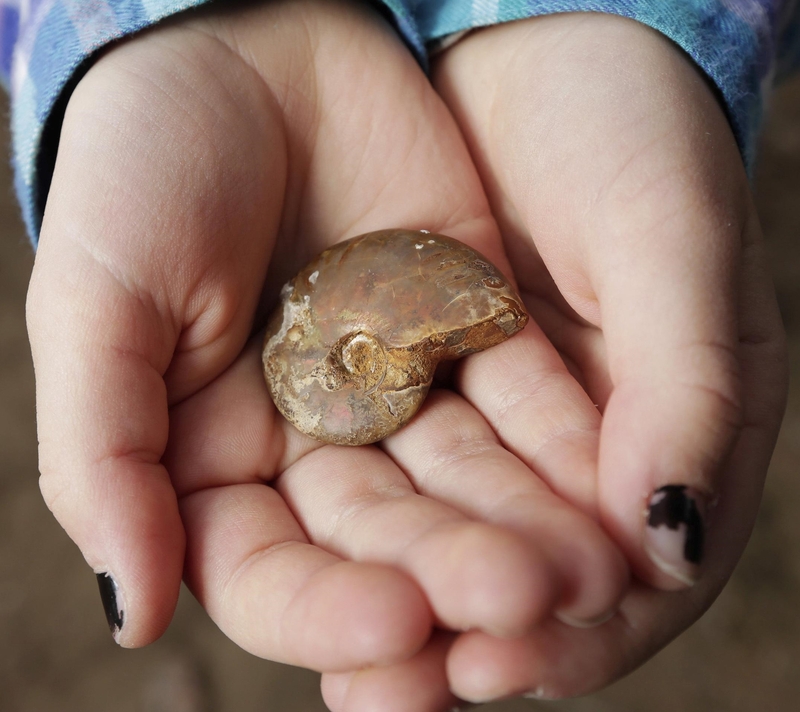 Naomi’s father, Darin Vaughan, said his daughter plans to keep the ammonite, which has become a cherished possession. Vaughan, a pediatrician with Mosaic Medical, said he is used to his children collecting rocks and other things they find. He even remembers being drawn to colorful rocks as a child. But this time it’s much different. His entire family, and the local paleontology community, are impressed with Naomi’s find. Now she’ll always have a memento of the precise moment that set her on the path towards becoming a brilliant paleontologist.